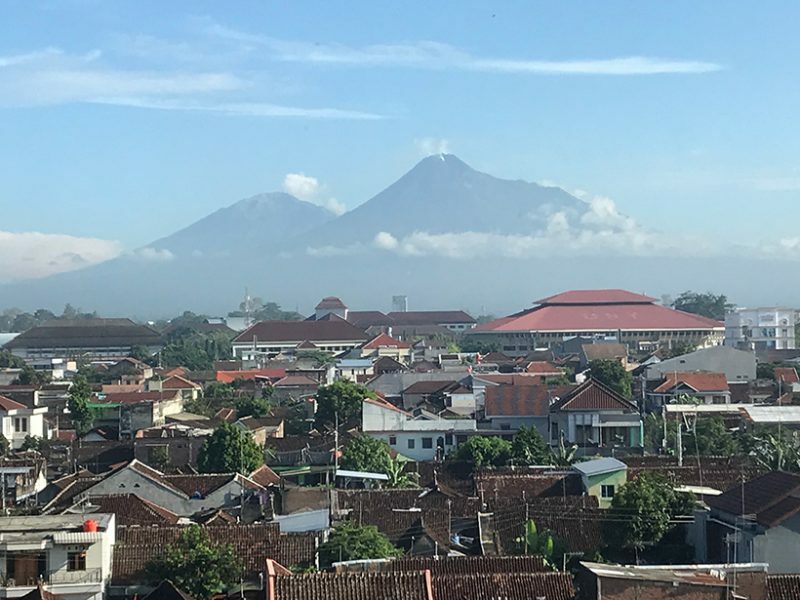 Optimizing the Use of Volcano Monitoring Database to Anticipate Unrest; Yogyakarta, Indonesia, 26–29 November 2018. In 2010, Mount Merapi volcano on the Indonesian island of Java erupted explosively—the largest such eruption in 100 years. Merapi sits only about 30 kilometers from the city of Yogyakarta, home to more than 1 million people. The 2010 eruption forced more than 390,000 people to evacuate the area, and it caused 386 fatalities. In the past few months, the volcano has started rumbling again, and it is currently extruding a dome that is slowly growing. Will Merapi’s rumblings continue like this, or will they turn into another large, explosive eruption? Answering this question largely depends on having real-time monitoring data covering multiple parameters, including seismicity, deformation, and gas emissions. But volcanoes can show a wide range of behaviors. A volcanologist’s diagnosis of what the volcano is going to do next relies largely on comparisons to previous cases and thus on the existence of an organized and searchable database of volcanic unrest. How do we standardize and capture spatiotemporal data produced in a large variety of formats and instruments? How do we go from multivariate (geochemical, geophysical, and geodetic) signals to statistically meaningful indicators for eruption forecasts? How do we properly compare periods of unrest between volcanic eruptions? Participants at an international workshop last November discussed these and other questions. The workshop was organized by the Earth Observatory of Singapore and the Center for Volcanology and Geological Hazard Mitigation in Yogyakarta. An interdisciplinary group of over 40 participants, including students and experts from more than 10 volcano observatories in Indonesia, the Philippines, Papua New Guinea, Japan, France, Italy, the Caribbean, the United States, Chile, and Singapore, gathered to share their expertise on handling volcano monitoring data, strategize on how to improve on monitoring data management, and analyze past unrest data to better anticipate future unrest and eruptions. Volcano databases such as WOVOdat aim to be a reference for volcanic crisis and hazard mitigation and to serve the community in much the same way that an epidemiological database serves for medicine. But the success of such endeavors requires the willingness of observatories, governments, and researchers to agree on data standardization; efficient data reduction algorithms; and, most important, data sharing to enable findable, accessible, interoperable, and reusable (FAIR) data across the volcano community.